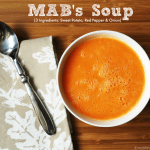 MAB's 3 ingredient soup is a quick & easy soup full of comforting, healthy ingredients. Change it but by the different herbs and spices you add. bouillon optional I use 1 teaspoon of Better than Bouillon to all my soups. Add all the vegetables and seasoning to a pot. Add water or broth to cover all the vegetables. Cover and cook on medium to medium high until all the vegetables are soft. Take off the heat and let a cool a few minutes. Add to a high speed blender or food processor and puree until nice and smooth. You may have to work in batches so you don't get burned. Return to the pan to heat if it's too cold to eat. Enjoy. NOTE: You can add so many different seasonings to change this soup's flavor. On it's own it is very delicious. Thai: Add 1 T of curry paste and 1/2 cup coconut milk. Garnish with cilantro. Indian: Add 1 T of curry spices and some grated ginger. Top with greek yogurt. Italian: Add 1 t of oregano,1 t of basil, 2 cloves of garlic. Mexican: Add 1 t of cumin, 1 t chili powder, 1/2 t paprika, 1/2 t garlic salt & 1/4 t of cinnamon. Savory: Add 2 cloves of garlic and 1/2 t of thyme and 1/4 t of sage.